My father loved steamed fish. It seemed to me that he had it all the time, that it was his favorite breakfast meal. With green bananas or yam. I think this habit of his of eating this way for breakfast was because he grew up in rural Jamaica where a substantial morning meal was common. I was never a big fan of steamed fish. I prefer my fish fried as crispy as chips so that the bones snap when I bite into them. Fast forward several years later and I’m dating. The guy I’m seeing – T – goes on and on about the steamed fish at Little Ochie. At first, I thought he was talking about someplace near Ocho Rios since, locally, everyone calls it “Ochie.” Then he explains that it’s a restaurant that has the best seafood in Jamaica. What could be so special about this particular restaurant, I wondered. I mean, any halfway decent housewife or chef knows how to steam fish. It wasn’t rocket science so I wasn’t impressed. Early one Sunday morning, T took me there. Used plastic cups, utensils, and food-streaked styrofoam plates had been tossed carelessly over the beach area fronting the restaurant. That and the large black speakers that were hoisted on stands at either end of the beach said that a dance had taken place the previous night. The staff was busy putting things back in order. T wouldn’t hear of the bammie and talked me into having my fish with Excelsior Water Crackers, a hard cracker with a dent in the middle that has been a staple of the Jamaican diet for more than 100 years. Unlike the bammie, Excelsior Water Crackers stand up well in everything from gravies and jam, to butter and meats. I’d never had it with steamed fish before but decided to give it a try. Back at our table in a thatched covered boat, we waited for the meal to arrive. It did, about 30 minutes later, covered in transparent wrap to protect it from sand and spills. My eyes bulged. This was not my father’s steamed fish, not in the least! 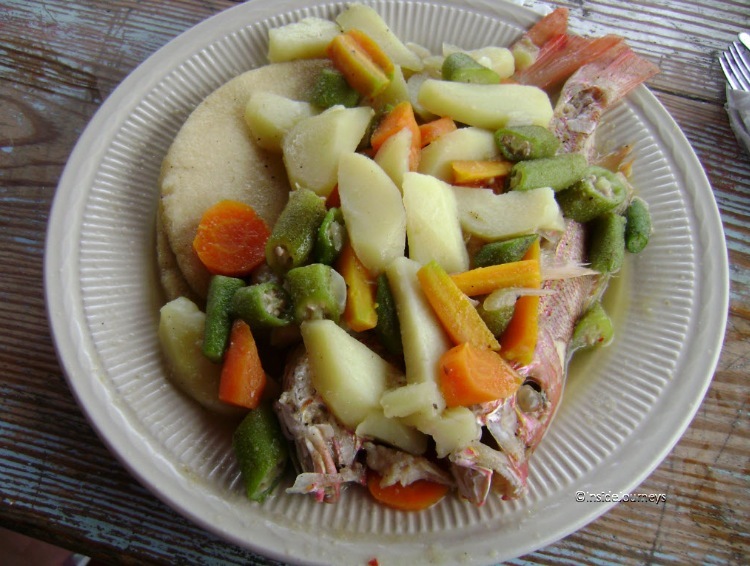 The fish, cooked whole and laid out on a large plate, was almost covered by strips of carrot, chopped okra, and slices of potato and cho cho (christophene or chayote). Crackers lined the plate like an embroidered collar. All the ingredients were cooked together, allowing the juices from the fish and vegetables to mix with the scallion, thyme, peppers and onions. Pimento (allspice) berries, with its mix of cinnamon, clove, pepper, ginger and nutmeg, gave it a nice warm, almost woodsy, flavor. The vegetables were soft but not mushy, the fish firm and succulent. I ate everything, including my words, that morning. I had to admit, it was the best steamed fish I’d had. I’ve been back to Little Ochie several times since then and, except when lobster’s in season, it’s the steamed fish I order – sometimes with crackers, other times with bammie. It tastes just the same as it did that Sunday morning. Slice the cleaned fish and season with black pepper, salt, and fish seasoning. Add to a large pot roughly a cup and a half of water (or more if needed) just enough to cover the fish. Next add all the other ingredients and cover the pot tightly. Simmer over medium heat until the fish and vegetables are cooked (approximately 20 minutes, it all depends on the thickness of the fish, so eyeball it). Add crackers at the end. Note: I modified this recipe that I found on the Jamaica Observer site. Leaving a comment. As a courtesy, please read the other foodie posts and leave a comment. That looks so appetising. What’s bammie? First time I’ve read about it. That looks great, I’m also not a steam fish fan, but when I try any of the Chinese style steamed, they know how to really treat fish and its always buttery and delicious! Yours also looks amazing! I must confess — I’m not a big fish person, but your description of the meal and the whole ambiance of the place gave me a bit of a craving. The hubby will love this one — passing it along. Oh man that looks absolutely delicious! This recipe looks amazing. I’m going to try it! Hope you get to try it, Irene. What a great story – I can almost taste the fish and I wonder if the crackers are a bit like the friselle eaten in Puglia. A kind of sea going bread with a long, long sell by date that is still very popular as a bed for fresh tomatoes and olive oil. That looks incredible! I wish more people here in the states would value breakfast like that. Most breakfasts are supposed to be quick and easy, but that leads to non-filling, non-delicious breakfasts. Taking the time to make something like that is awesome. Will have to try it out! I agree, Richard. Breakfasts like these take time but it’s worth it. It’s delicious and filling. I Googled friselle but it looks a bit different. The sell date on these crackers isn’t that long — but they’re great for jams, jellies, soups, just about everything. Sorry you don’t like fish, Cathy, but let me know when Mr. TWS tries this one. Ooh, I love the way the Chinese do their fish, Noel. I used to go to a restaurant that did a mean steamed fish, I’m tasting it now. A bammie is a flat bread made from cassava, Marlys. It looks like a Pita. This looks so good, Marcia! I just one leettle problem (bad experience) of fish on the bone or with bones in them. Having it fried or fileted would be better for you then, Mike.